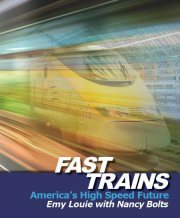 The US High Speed Rail Association announces the publication of Fast Trains – America’s High Speed Future. Written by the USHSR Director of Outreach Emy Louie with Nancy Bolts, Fast Trains is a must-read book on the subject of high-speed rail. In a very short time, the book has generated considerable buzz and interest in media, the internet, and throughout the publishing world. Fast Trains is a compelling, entertaining, and informative read. There is no other book like it that so thoroughly and interestingly explores the history of trains and transportation in America and all of the benefits of creating the best system of high-speed rail in the world right here in the United States. Book reviews are glowing: “Five Stars. Phenomenal! Fast Trains: America’s High Speed Future is key to making high speed rail happen in the United States. It provides tremendous encouragement to weary travelers like me. Fast Trains describes state-of-the-art transport using practical stories everyday travelers can relate to. Read the book. Tell your story. Promote this book far and wide. America will get a state-of-the-art high-tech, safe, and reliable transportation system.” -David M. Schwegel, Professional Engineer, Team Leader, Californians for High Speed Rail, Sacramento, California. This entry was posted in Vision and Leadership and tagged Andy Kunz, Emy Louie, fast trains, Fast trains book, high speed rail book, high speed rail books, thomas hart, US High Speed Rail Association, ushsr. Bookmark the permalink.